An example of "parking dibs" on a Chicago street. Chicago has long been dubbed "The City that Works," come Snowpocalypse or high water. Our springs begin late with constant drizzle, melting in to hot summers that end too soon. The crisp bliss of fall is even more agonizingly brief, with winter nipping at November, setting its icy talons by Black Friday, and casting an inescapable grey pallor over the city from December through March. the homebody hermit, resurfacing on New Years Eve after weeks spent in hibernation. 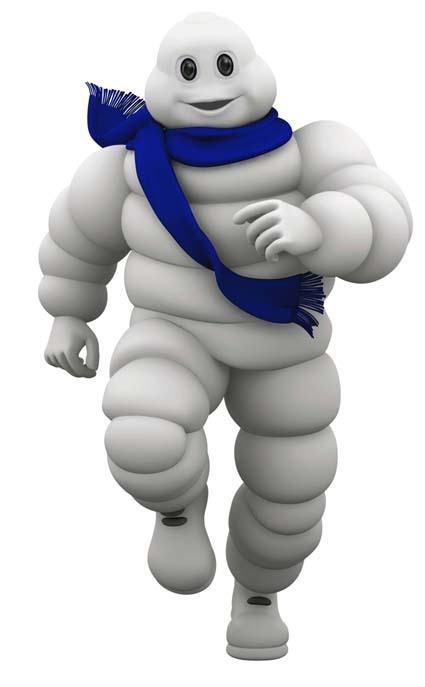 the dark-puffy-coat-wearer, slogging begrudgingly through the snow alongside identically dressed, equally miserable-looking michelin men. the person who travels to get away from Chicago. Low temperatures vary from year to year, usally averaging somewhere between barely tolerable and bitterly excruciating. Still, whether you&apos;re a fear-stricken newcomer to the Midwest or a seasoned Chicagoan already worrying that this winter will smack us harder than the last, take heart: you can still go outside and have fun. This will my fourth Chicago winter, and I&apos;ve learned a great deal since that first Snowmaggedeon tested my Southern naivety (I used to think that 30 degrees was "cold") and toughened me up for the years that followed. Outsiders are aghast by horror stories of "lake effect" and wind chill; but thankfully, Chicagoans know that protection exists in the form of layers. We also know that many establishments tend to overcompensate for the winter cold by cranking up the heat, meaning that you will be grateful for the lightweight shirt tucked under your other layers that you can strip down to once inside. I&apos;m particularly fond of smart button-down shirts under cosy sweaters, hooded parkas or bomber jackets lined with faux fur or sheepskin, floral skirts over wool tights, chunky scarves to shield one&apos;s face from the cold, and soft cashmere cardigans for every holiday party. Cotton is a poor choice for winter clothing material due to its high thermal conductivity, so choose synthetic fibers (polyester blends, microfiber, fleece) or wool instead. Make sure that your boots are snow-resistant. When you&apos;re out shopping for that perfect pair of oh-so-fashionable winter boots, remember that sustainability trumps style. Will these chic ankle boots turn my feet into moisture sponges as soon as I step outside? Will these department store boots persevere through months upon months of winter trudging? Will that slender heel get stuck in the snow? Always ask yourself these questions before buying a pair, and look for styles that go at least halfway to your knees. Cover your head and hands. Hats and gloves may be superfluous accessories in warmer climates (I see you, ironic hipsters wearing beanies and fingerless mittens at 70 degrees) but not in Chicago. Here, you can use them for their intended purpose and look like an Urban Outfitters model at the same time. New to Chicago? Allow me to explain the rules of "parking dibs." 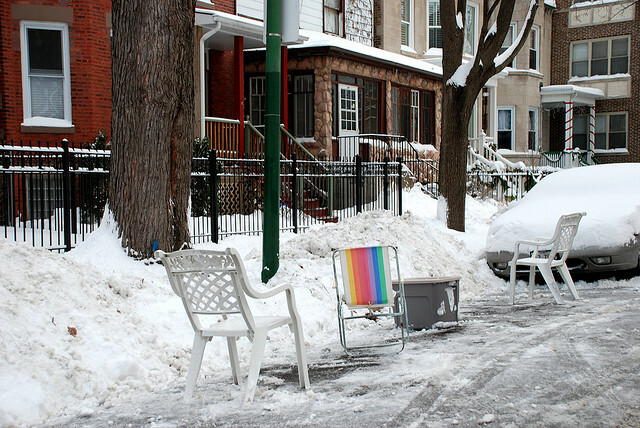 During snow season, Chicagoans put various junk items on the street (usually chairs, sometimes large bins or cinder bocks) on their shoveled-out parking spaces to deter other drivers from taking their spot. Legend has it that this practice began during the Chicago Blizzard of 1967, when 23 inches of snow fell in 29 hours, and cemented its status during the infamous winter of 1979, when almost 90 inches of snow collapsed the CTA. However, according to the Chicago Tribune&apos;s Eric Zorn, the term "dibs" was first applied in this context by John Kass in 1999, and has since spread elsewhere. Now, "dibs" is called even during the most minor of snow days, prompting many disgruntled neighbors to question the fairness of a tradition not officially sanctioned by the city. More information on the rules of this amusing and baffling saga can be found here. My two cents? Never move the chair. Just don&apos;t.
I suggest a good bourbon whiskey or scotch. Sip responsibly for extra warmth. Go out to stay in. Your friends may not be as keen to go bar-hopping as they were in June, but the promise of spending all night indoors (and still having a good time!) should be enough to lure them outside for a quick commute. Whether it be a trivia grandslam at your neighborhood pub, a show at the Empty Bottle, an all-night dance party at Smart Bar, or a night of drinking and white elephant gift-giving at your apartment, fun can still be had by all. Leave your coat at the door (this is where those layers come in handy!) and rock that ugly Christmas sweater. &apos;Tis the season. What are your Chicago winter survival tips?